The heavens opened in the first half and the shots rained in in the second but Biggleswade’s water-tight defences were breached just once to deny Brakes a deserved three points on Saturday, writes Paul Okey. After Ahmed Obeng cancelled out Inih Effiong’s 15th-minute opener shortly before the break, Biggleswade were indebted to resilient defending and an inspired display of keeping from Ian Brown to earn a share of the spoils. The fact that so many openings were created on a wretched afternoon was credit to the home side, who grew into the game after initially struggling to get to grips with Town’s burly frontman Effiong. 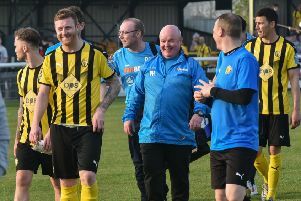 The striker had already given early notice of his threat by rounding Lewis Gwilliams, deputising for the suspended Tony Breeden and then taking the ball past a covering defender. However, instead of going for goal he tried to pick out a supporting player and the chance was lost. He was to be more clinical in the 15th minute, turning James Mace inside out before firing a low shot across Gwilliams and into the far cornet of the net. A superb last-ditch block from Jamie Hood prevented what looked like a certain second for Effiong but as the rain turned from torrential to biblical it was now Brakes’ turn to ask questions. Ryan Rowe and Obeng were unable to force the ball home inside the six-yard box after a superb pass with the outside of his right foot from Gudger, while Darren Pond’s well-struck effort was charged down by a visiting defender. An Obeng run from deep took him to the edge of the Waders box but he failed to get decent purchase on his shot and it was comfortable for Brown. He needed much less power for his next effort, however, tapping home Jack Edwards’ cross-shot at the far post to bring it back to 1-1. The goal came three minutes before the break but Brakes were not done and could have easily been ahead going into the interval. Gudger found Obeng on the corner of the six-yard box and after the wide man had made a hash of his initial effort, he skewed his second shot across the face of goal when it looked easier to hit the target. Another direct run from Obeng then set up Rowe but his tame effort was straight at Brown. A George cutback presented Edwards with the first opportunity of the second half, but with Brown motionless, his shot whistled by the post. Courtney Baker-Richardson departed in the 56th minute after picking up a knock and his replacement, Lee Moore, was quickly into the action, bringing down a half-clearance and flashing a shot just wide of the far post. With Effiong well-marshalled, it was one-way traffic and Moore was again unlucky not to put the hosts in front, taking advantage of defensive uncertainty to nip in between Lucas Perry and Brown and lob the keeper. However, Town skipper Russell Short raced back to clear the ball off the line. Mace stabbed an effort straight into the arms of Brown after a dangerous ball into the box had ricocheted his way, while Gudger was narrowly wide of the mark after wriggling past two challenges on the edge of the box. Obeng looked to be away only for a superb last-ditch challenge from Short to divert the ball behind his own goal, with Brown then producing a miraculous save at the far post to somehow keep out Hood from close range after the defender had muscled his way on to the end of Rob Thompson-Brown’s corner. Short was again there to cut out an Edwards pull-back and Biggleswade’s goal continued to lead a charmed life as the ball pinged around the box from the resultant corner, with both Edwards and Rowe unable to get a telling touch. Obeng drew a smart stop from Brown at his near post and Mace was inches wide of the far post with a glancing header from a Thompson-Brown free-kick before sloppy play at the back almost allowed Robbie Parker to carry out a smash and grab for the visitors but Hood put his body on the line to block the shot. Tom James was introduced for Brakes in injury time and nearly made his short cameo count, crossing for Moore, whose first-time effort on the stretch produced a fine fingertip save from the excellent Brown. It earned the keeper the acclaim of both sets of fans at the final whistle but that such an entertaining game took place at all in conditions bordering on farcical was also worthy of applause. BRAKES: Lewis Gwilliams, Ben George, Connor Gudger, Darren Pond, Jamie Hood, James Mace, Courtney Baker-Richardson (Lee Moore, 56), Jack Edwards, Ryan Rowe (Joe Magunda, 84), Rob Thompson-Brown (Tom James, 90), Ahmed Obeng. Subs not used: Rob Elvins, Ryan Quinn. Biggleswade: Ian Brown, Callum Lewis, Lucas Perry, Russell Short, Gavin Hoyte, Evan Key (Connor Hall, 46), Connor Vincent (Daniel Clifton, 36), Robbie Parker, Inih Effiong, Tony Burnett, Mark Coulson. Subs not used: Sam Donkin, Harry Norman, Chris Marsh.